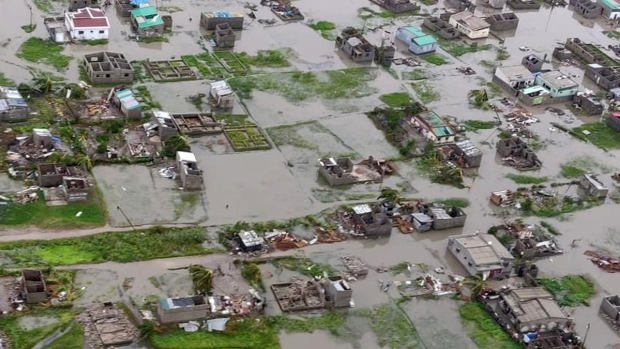 More than 1,000 people were feared dead in Mozambique four days after a cyclone slammed into the country, submerging entire villages and leaving bodies floating in the floodwaters, the nation's president said. "It is a real disaster of great proportions," President Filipe Nyusi said. Speaking on state Radio Mozambique, Nyusi said that while the official death toll stood at 84, "It appears that we can register more than 1,000 deaths." Emergency officials cautioned that while they expect the death toll to rise significantly, they have no way of knowing if it will reach the president's estimate. More than 215 people were killed by the storm in the three countries, including more than 80 in Zimbabwe's eastern Chimanimani region and more than 50 in Malawi, according to official figures. Hundreds more were reported injured and missing, and nearly 1,000 homes were destroyed in eastern Zimbabwe alone. Doctors Without Borders said rivers have broken their banks leaving many houses fully submerged and around 11,000 households displaced in Nsanje, in southern Malawi. "I was indoors with my children, but when we looked we saw mud coming down the road towards the houses and we fled," Francisco Carlitos told Lusa, the Portuguese News Agency. The family lost their home and possessions but safely reached higher ground. The country's president, who cut short a visit to neighboring Swaziland over the weekend because of the disaster, spoke after flying by helicopter over Beira and two rural provinces, where he reported widespread devastation. "The waters of the Pungue and Buzi rivers overflowed, making whole villages disappear and isolating communities, and bodies are floating," Nyusi said. The United Nation's humanitarian office said the government issued flood warnings and said heavy rains were forecast for the next 24 hours, including in areas already hit hard by Idai. U.N. officials cited reports that Beira Central Hospital's emergency room was flooded and without power, and that much of the building's roof had collapsed. Doctors Without Borders said it had completely ceased operations in Beira hospital, local health centers and throughout the community. The destruction in Beira is "massive and horrifying," said Jamie LeSueur, who led a Red Cross team that had to assess the damage by helicopter because of the flooded-out roads. The U.N. also warned of devastation outside Beira, in particular of livestock and crops. "As this damage is occurring just before the main harvest season, it could exacerbate food insecurity in the region," the U.N. humanitarian office known as OCHA said. More recently it has been exporting aluminum and electric power, and deposits of natural gas were discovered in the country's north. Edith M. Lederer contributed to this report from the United Nations.